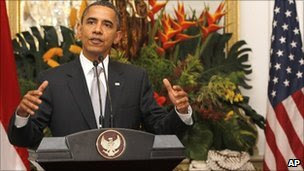 At a news conference in Jakarta, Indonesia President Obama criticized the Israeli government for an announcement that Israel has advanced plans to build 1,345 homes in Jerusalem and said that this kind of activity is never helpful when it comes to peace negotiations. The EU Foreign Policy Chief Catherine Ashton said that she is extremely concerned by the Israeli announcement, a plan which Ashton said contradicts the efforts by the International Community to advance the peace process in the Middle East. The announced plans by Israel to build homes in their capital city of Jerusalem has world leaders in an uproar, evidence that Bible prophecy will be fulfilled. The announcement by Israeli officials that the plan to build more housing units in the capital city of Jerusalem has evoked criticism from world leaders. They say Israel must not build in Jerusalem because it hinders the Middle East peace process. Ironically, President Obama chose to criticize the Jewish state from the stage of his visit to the most populated Muslim nation in the world, Indonesia. The EU Chief of Foreign Policy, Catherine Ashton, was very quick to criticize Israel for building in the city that has been Jewish for over 3000 years. In fact, King David, the second Jewish king, made Jerusalem the eternal, Jewish, political capital and spiritual center 1000 years before Jesus Christ came to the earth, II Samuel 5-6. The Lord promised King David that Jerusalem would belong to the Jewish people forever. He did that with the giving of the Davidic Covenant as recorded in II Samuel 7. God told the Jewish prophet Jeremiah that the Davidic Covenant cannot be broken unless the Sun, the Moon, and the stars fall out of Heaven, Jeremiah 33. This said, Bible prophecy reveals that in the last days Jerusalem will be the center of controversy, Zechariah 12:2. With world leaders criticizing construction of Jewish homes in Jerusalem, there is evidence that Bible prophecy will be fulfilled.